PureousTM Degreaser and Cleaner is a revolutionary new product that works by use of PureousTM powered technology that cleans at the molecular level. Unlike other cleaners it attacks dirt, stains, oils, grease, grime & odors at the source rendering them bio-unavailable making them go away and stay away forever. 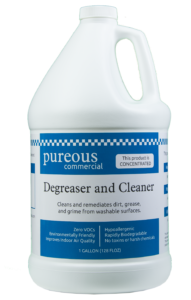 PureousTM Degreaser and Cleaner is an easy to use all-purpose cleaner that will effectively clean all types of surfaces including windows, mirrors, floors, walls, restrooms, sinks, urinals, toilets, kitchens, stoves, tile & grout, stainless steel, table surfaces, concrete floors, counter tops and more…. By stocking PureousTM in your inventory you can minimize SKU’s, Inventory surplus, storage, and employee training.